Craft Hackers | Get Your Craft On! Craft Hackers is the team of Quiltoni and Craftigurumi. With their combined crafty forces they will one day rule the world with fabric and yarn. Toni! 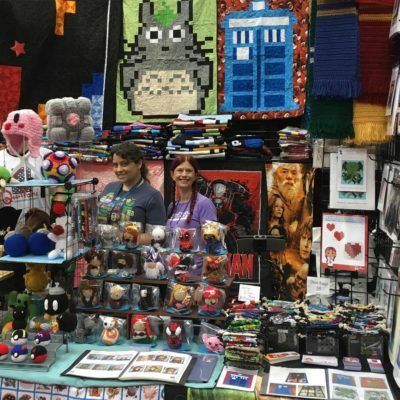 She has been selling her original Comic Book and Video Game quilts at conventions for years. Her pattern line of pixelated quilts teach the basics of quilting while teaching experienced quilters new techniques. She also travels to teach classes, lecture, and give trunk shows. Well, it’s the long work in progress of one woman (Nicole) as she found one form of art that she loved more than any other. The word comes from the smushing together of the words ‘craft’ and ‘amigurumi’. Which basically just means that I love to makes things out of yarn, and sometimes other mediums as well. I’ve been pursuing art as a career since I was around 16, and have only just focused on making it craft/yarn based for the last 4-5 years. Check us out at our upcoming conventions and appearances!